Even if you have financial wherewithal, the chances of ever owning a real A/C-Shelby Cobra are slim. There just weren't many made. If you like the looks and performance of the Cobra (and who doesn't?) you could buy a kit car, but the engineering, build quality and safety of kit cars are always "iffy" at best. 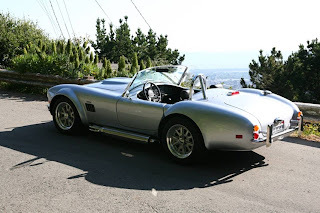 This is a 1996 Excalibur Cobra. Built by the same company that built the gaudy Excalibur 1927 Mercedes-Benz recreation, this is an actual DOT recognized car, one that meets all DOT and EPA regulations for the year it was built. This is not an exact replica. 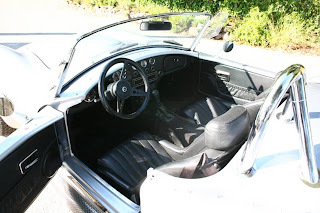 Certainly the body is based on the Shelby Cobra, but it's longer, lower and wider than the original and has "modern" amenities such as air conditioning and a tilt steering wheel. Being a 1994 car, things like seat/shoulder belts, side marker lights, high-mount brake light and assorted passive safety equipment are standard. The engine is Ford's ubiquitous 5.0 Liter fuel injected H.O. V8 and the transmission is a 5 speed Borg-Warner unit. The Excalibur Company is, remarkably, still in business. It's been in bankruptcy 4 times in the past 23 years (1986, 1991, 1992 and 2002), but has survived. It no longer builds cars, but supplies parts for existing Excalibur cars. It also offers a restoration service. I'd love to own a real Cobra, but there's little chance that's going to happen. Even if it did happen, there's no way in hell I'd drive a real Cobra on the street. 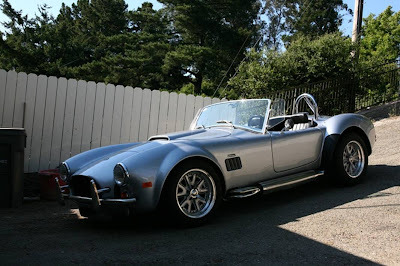 Besides the fear of wrecking a truly classic car, real Cobras just aren't practical street cars. This car is a great compromise... The "essence" of the original Cobra in a more practical package. Excalibur? Did they not produce some of them weird looking 1930's 40's styled cars in the 80's? Yes, it is the same company.